Commercial properties are often large, sprawling expanses that may be the site for a corporate campus, warehouses, office buildings, or more. Despite not being a small or cozy area, expansive commercial landscapes don’t have to remain barren or boring. Kafka Granite is familiar with making large-scale projects look beautiful inviting, as can be seen by our work on the Navy Pier, Buckingham Fountain, and Loyola University. We understand trying to strike the right balance between creating a good-looking space while maintaining its functionality. 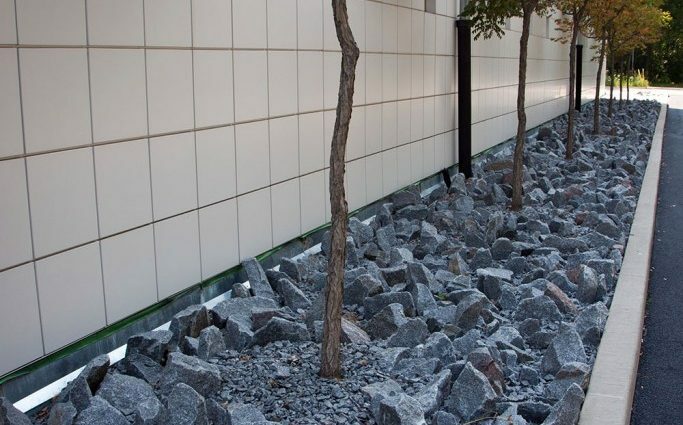 By providing landscaping materials that are both beautiful and incredibly durable, Kafka is able to offer the product you need to make your commercial landscape architecture stand out from walkway to retaining wall. Whether you’re starting with a blank slate or have some pathways or parking lots in place, let us help you with designing your commercial landscape. Not only will we help you to transform or complete your project, but with our green alternatives you can take your project one step closer to obtaining a SITES or LEED certifications. The very first step to ensuring your commercial landscaping is stunning, and logical, is to make a plan. How extensive or simple this step is may depend on the size of your lot or the scope of your project; the larger the lot or project, the more planning you may have to do. If you’re sure of what your property needs when it comes to the landscape, then you might be able to do this part by yourself. If you’re uncertain about how you want the layout of your landscaping to “flow,” then the eyes of a professional landscape architect may be necessary. Draw a map of your property and make note of where structures and trees already exist as well as where the sun hits during the day as this could affect where you plant certain types of sun-loving flora. Once permanent items are marked, the next step is to play around with where you envision things like parking lots, outdoor seating, pathways, gardens or courtyards. Remember that pathways and courtyards don’t have to be so linear or square—make sure to test out different curving lines or shapes, and see what feels best. Additionally, consider how you truly want the space to be used. Can you see your staff wanting to sit outdoors for lunch? Do you envision guests walking along an especially scenic part of the lot? Is there a steep grade that would benefit from a retaining wall? By thinking about how the space will be used, you’ll be better able to plan for what you build in it. This initial phase is also a good time to try and tie your landscape architecture to the design of your building. You can complement the colors or textures of existing structures by using different colors of granite or flowers within your gardens. Create a tentative color palette for your overall design to serve as an inspiration for the rest of your project. The landscape architecture of your business is also important in that it can make or break a visitor’s first impression. If your business is one that sees a lot of visitors, who are clients or otherwise, focus on making a good first impression. This means making the entrance a focal point so that it’s easy to find and is welcoming. Establish a clear path from the parking lot to the entryway. When it comes to essential elements like trash bins outside the entry, consider using tasteful and good-looking alternatives to the plastic garbage can. 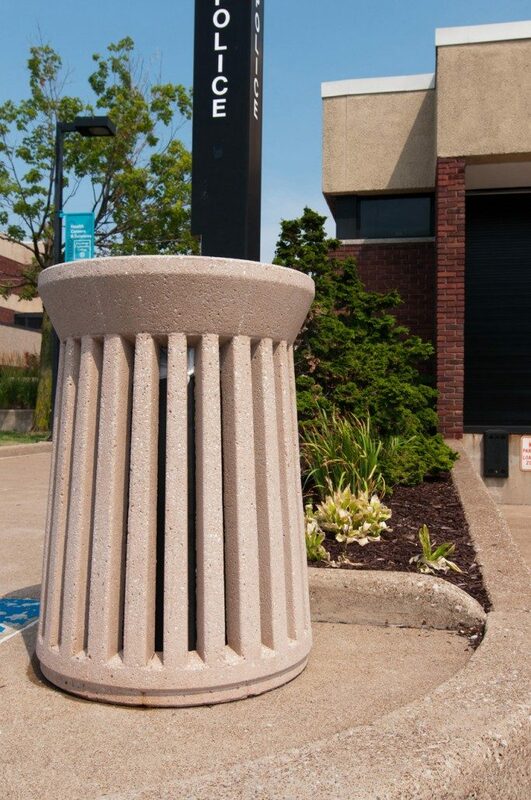 By using alternatives like a crushed granite decorative precast waste receptacle, you can make garbage go away with an aesthetically pleasing container. 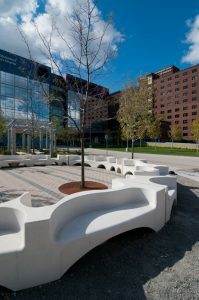 What’s more is that decorative precast features can be made using any color of granite to match or complement materials used elsewhere, and they can include outdoor furniture like benches, tables, and more. Kafka Granite for example, offers over 50 different colors of decorative precast aggregates. What will your pathways be made of? Do you prefer cobbles, pavers or decomposed granite? Each material will have a different aesthetic appeal and one may match the look of your building’s architecture more than the others. What color will your pathways be? Color is always a tough decision whether you’re painting a wall or choosing an aggregate. Do you want a natural look? Perhaps you want a look where the pathway truly pops? When you come to Kafka Granite for crushed granite walkways, you’ll be met with over 50 color options. With variety like that, you have your pick of neutrals, greens, reds and more. What kind of traffic will be on your pathways? Something you may have considered in your planning stage is how your pathways will be used—are you expecting just foot traffic or will there also be bike, golf cart, ATV or light vehicular traffic? By measuring the wear and tear that will be taking place on your paths, you can choose the best material available whether it’s standard, stabilized or wax polymer. We’ve spoken extensively about the difference between these three pathway materials on our blog. What is your parking lot going to be made of? Not every parking lot has to be an endless sea of asphalt. Don’t be afraid to incorporate your parking lot into your grand landscaping architecture design. 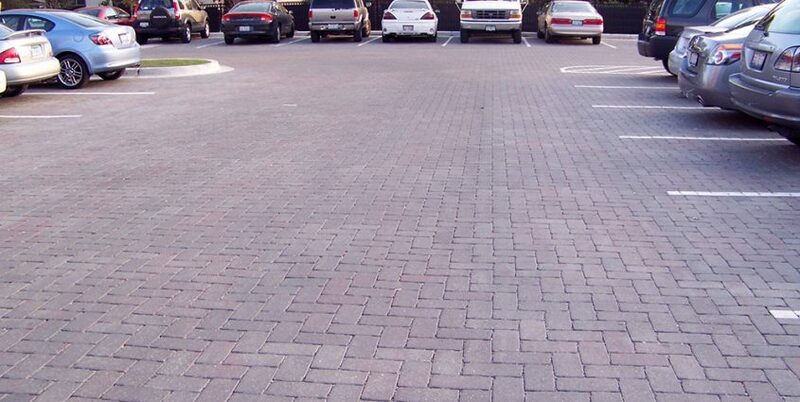 In lieu of asphalt, imagine using permeable paverss with environmentally friendly permeable paver grit. Depending on your landscape architecture, the gardens or foliage in your design may be natural and unenclosed, or they may require a bit more structure from distinct edging and retaining walls. Retaining walls can be made from boulders or more angular decorative rip rap if you’re looking for a unique and beautiful option. And when it comes to your flowerbeds, will you be using decomposed granite landscaping stone or mulch as your base? These options may seem small but they can make all the difference when it comes your project’s end result. How much money or time can you put toward maintenance? If the answer is, “Very little,” then perhaps high-maintenance gardens aren’t the solution for your landscape. Crushed stone-based xeriscapes can are becoming more popular as they require less maintenance and water, and they are a beautiful alternative to thick gardens. Consider this factor when ultimately deciding how much hardscape to incorporate into your design. If you’re looking to get started on a commercial landscaping project, make sure you do it right. Coming to Kafka ensures you get the best materials and the best selection on the market to achieve exactly what you envision. Call us today to find a dealer near you or to speak with one of our expert consultants. If you’re a landscaping materials dealer searching for a way to carry a great selection, chat with us to find out about our dealer program. With so many colors and materials to outfit every part of your landscape’s design, you’ll be thrilled you chose Kafka Granite. City parks and nature reserves are places where whole families can go for a fun retreat from the rigors of the day. Outfitted with a variety of amenities ranging from groomed pathways to open fields to playground equipment and basketball courts, parks are a way for everyone to unwind with a breath of fresh air. Kafka Granite has played a role in paving parks and pathways with high-quality aggregates for decades. 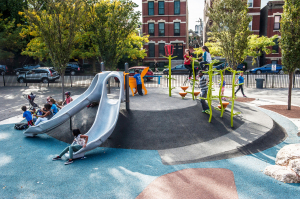 From large projects like Brooklyn Bridge Park in the heart of New York City, to smaller local parks and community recreation facilities, Kafka knows the importance of creating healthy public spaces that anyone can enjoy. With incredible varieties of pathway mixes and ballyard materials, we’ve been able to help pave recreational walkways and athletic surfaces for a wide variety of public and private applications. That’s a lot of fun memories being made on our aggregate mixtures. Throughout the decades, we’ve seen the evolution of city parks as we know it, and there is a new trend in public arenas that has us excited: exercise parks. In lieu of the traditional teeter-totters and merry-go-rounds for children, exercise parks are built with health-related stationary equipment for adults to boost their heart rates and enjoy physical activity in the company of friends and community members. It’s no secret—obesity has become a veritable pandemic throughout America. Scales are tipping as new data shows that more than one-third of U.S. adults are considered obese with 1 in 20 reaching extreme obesity. An addiction to sugar, easy access to cheap processed foods, and longer working sedentary working hours have created a population of people who need more options for getting fit. Many barriers to exercise include poor proximity to a gym or the cost to join the gym. Additionally, a lot of people don’t like the feeling of being boxed into a gym—the smell, the congestion, and the crowds can be turn-offs for many. Exercise parks are an excellent alternative for people looking to get fit for free in the great outdoors. They’re also a way for cities to show that fitness and health are public priorities that will help everyone live longer, happier lives. As more cities realize that accessible fitness spaces are good for everyone, the more you can expect to see them pop up. Priority for construction is in “fitness deserts,” or areas where there aren’t many (or any) fitness options. These areas also open the floodgates for people who are new to working out; they can try a simple machine at first and work up to more at their own pace. And the convenience is virtually unbeatable. Long gone are the days of watching your kids play at the park from the seat of a park bench. Instead, adults can keep an eye on young ones from their perch on the elliptical or weight machine. Wide Variety of Exercises and Benefits—for Free! You may be wondering how an exercise park can include more equipment than playground staples like monkey bars or ladders. The evolution and affordability of weather-resistant, tamper-proof exercise equipment is surprising. Equipment targets the full range of muscle groups and joints, and they’re easy to use by people of all skill levels and abilities. From bodyweight equipment such as chest presses, body curl stations and parallel bars, to cardio machines like ellipticals and hand cycles, these parks truly serve as a well-rounded fitness arena for anyone to use, anytime of the day. While many exercise parks include one clearing with the equipment planted in a common area, some parks are starting to incorporate fitness trails. A walk or jog along these trails will have you coming across a variety of fitness stations that each target different muscle groups or fitness activities. Not only will the fresh air keep participants motivated, but the natural surroundings are sure to be more pleasant to get fit in than a muggy and crowded gym. Kafka has, of course, been more than happy to help urban developers find the perfect standard or stabilized stone pathway mixtures that make the perfect exercise trail. Does your next outdoor project include planning and building an exercise park? Kafka Granite can help. A successful exercise park is going to need to be supported by any number of additional attractions, such as walkways to and from the park, ballparks for play, and bike paths for commuters to reach the park. The materials chosen for these additions needs to be able to withstand high amounts of foot traffic, digging and cutting from busy feet, and a variety of weather types. Kafka may have just the solution you’re seeking. With a palette of nearly 60 colors to choose from, any exercise park can get a bold injection of color or a natural aesthetic with Kafka Granite stone through high-end pathways materials. And with a broad range of ballyard mixes, your ballfield won’t be left out when redesigning your entire park space. The materials used in both our pathway and ballpark mixtures can withstand rigorous activity while providing active park goers with safe footing while on their way to or enjoying their favorite outdoor activities. Additionally, with our permeable aggregates, both pathway and ballyard mixes, your park visitors will be able to enjoy your park’s facilities regardless of rain or shine. No one wants to slosh through mud to get to your exercise park or neighboring ballfield. Maintaining clear pathways will eliminate one more obstacle that’s keeping your community members from getting active. Both the elderly and young will rely on dry, non-slip pathways to get them where they want to be in your finished exercise inclusive park. If the entire park goes from fitness haven to swimming pool, the value of the equipment is lost and deterioration could set in if the machines are left surrounded by a moat of water keeping would-be exercisers away. Instead of making health-hungry citizens wait days for a path to clear to reach their new favorite exercise park, install a solution like a stabilized decomposed granite surface. Natural, permeable, and durable, this option would be able to hold its own against rigorous exercisers and torrential downpours alike. It’s also easy to install, maintain, and replace over the years. 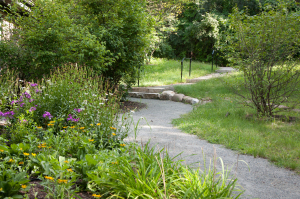 Less obtrusive than cement or asphalt, it’s a popular pathway choice for outdoor facilities. If you’re stuck wondering what the perfect addition to your city would be, consider an exercise park. Grants can be obtained to help alleviate financial restraints and the benefits for the community are undeniable. Playgrounds are evolving and adults can now have some fun, too. Instead of taking a backseat to their kids running around, adults can get in on the fun and break a sweat, too. If you’re considering incorporating an exercise area into your next park, or if you’re already in the planning phases of construction, don’t hesitate to give our experts a call and ask about our ideal landscape material options. Avoid getting stuck with unsightly asphalt and nonporous cement. Instead, use a beautiful, durable, permeable and more supportive surfaces to help everyone achieve their fitness goals. The sun is shining, the birds are singing, and Kafka Granite only has one thing to say; “Let’s play ball!” Kafka is proud to manufacture a variety of premier ballyard, warning track and clay mound materials. We have helped create stunning fields for every field from little league to the majors. Visitors can view Kafka ballyard materials at Yankee Stadium, Northwestern University, and the Buffalo Grove Sports Complex, to name a few. Our top-quality ballyard materials are made of decomposed granite mixtures that have been crafted to withstand a variety of environments. From torrential rains to blistering heat, our ballyard mixtures can take a beating and still performs at their highest level. With our wide range of ballyard products, we are able to work with your budgetary requirements and deliver a top-quality finished product. At Kafka Granite, we offer three variations of ballyard mixtures; Standard Mixes, Stabilized Mixes and Hilltopper Mixes. Traditional mixes that are comprised of clay, silt or sand become muddy and collect standing water in rainy conditions. By utilizing a proprietary decomposed granite blend, our ballyard materials are highly durable and permeable, meaning that they allow rainwater to quickly drain. This feature will drastically decrease the number of rainouts you experience each year and will keep your ballpark mud and dust-free. Kafka offers both Burma Red Standard Topdressing and Standard Warning Track Mixes. Our Burma Red Standard Topdressing is a great addition to existing fields due to its excellent drainage characteristics. With our Burma Red Standard Topdressing, you can eliminate puddles on your field and substantially reduce rain-outs. Additionally, our Burma Red Standard Topdressing is a cost-effective way to refinish your existing ballfield to achieve safe footing, consistent ball hops, and smooth sliding. We recommend a depth of ¼-inch to ½-inch when adding Burma Red Standard Topdressing to an existing ballpark. If you are looking for a cost-effective way to refinish your existing ballfield while improving your field’s draining capabilities and correcting any imperfections that have accumulated over time, our Burma Red Standard Topdressing is the best option for you. Our Burma Red Standard Topdressing can be used on the infield, warning track, batter’s box or pitching mound. Our unique Standard Warning Track Mixtures offer a highly durable warning track solution for those looking to replace their current warning track. Our Standard Warning Track Mixtures come in three vibrant colors: Burma Red, Red Cedar and Ruby Red. With its signature crunch, Kafka Standard Warning Track Mixtures help players know when they are approaching the outfield fences to prevent injury. Our Standard Warning Track Mixtures are durable and are created to withstand the abuse of maintenance vehicles and harsh weather alike. Due to its coarser nature, our Standard Warning Track Mixtures require less maintenance than other traditional Warning Track Mixtures. We recommend that our Standard Warning Track Mixtures be installed at a full depth of 3-4 inches around the entire perimeter of your ballfield. Our team of experts can help you estimate the amount of Standard Warning Track Mixture that you need for your next ballfield project today. If you are tired of puddles that just won’t drain, our Burma Red Stabilized Infield Mix is the perfect solution for your ballfield. Pre-blended with a stabilizing organic binder, our Burma Red Stabilized Infield Mix is one of the best permeable infield mixes available. By utilizing an organic binder, our infield mix provides a firm, resilient playing surface that results in minimal mud or dust accumulation. Our Burma Red Stabilized Infield Mix has an excellent water-bearing capacity and load-bearing strength. Even after heavy rains or high traffic, our Burma Red Stabilized Infield Mix will stay in place while retaining its flexibility and cushion. Stadiums can drastically cut down on wind and water erosion damage by utilizing a Burma Red Stabilized Infield Mix. All of the previously mentioned features combined result in near immediate play after rainfall, and fewer hours will be needed for ballyard maintenance. Our Stabilized Warning Track Mix offers the same great features as our Standard Warning Track Mix, but requires less maintenance and can withstand heavier traffic. The Stabilized Warning Track Mix is ideal for larger projects, or areas that receive excess rainfall. With the addition of the stabilizing binder, the Stabilized Warning Track Mix retains water longer, requiring less manual watering. 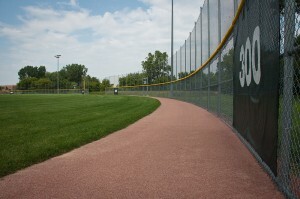 This Stabilized Warning Track Mix is ideal for universities and large sports complexes. Before you begin installation of your new Warning Track or Stabilized Infield Mix, make sure that you are familiar with the field’s drainage patterns and how the surrounding areas affect the field during heavy rains. Both infields and warning tracks should be sloped at ½% to drain laterally off the field. Measure and layout infield or warning track according to field dimensions. Flag sprinklers if already installed. Excavate future infield or warning track area to allow a minimum 3-inch depth. Complete drainage construction if desired. Prepare native soil to use as a base. Sand is not an acceptable base. Level, preferably with a laser grader. Water native soil base. Allow time for drying before proceeding to next step. Soil should be damp, but not muddy. Compact native soil using a one-ton drum roller. A plate compactor can be used in tight areas. Spread Kafka Stabilized Infield or Warning Track Mix with a front end loader. Lay down loose material to allow for a minimum of 3-inch compacted depth. The estimated coverage for Kafka Stabilized Infield and Warning Track Mix is 70 square feet per ton for a 3-inch depth and 50 square feet per ton for a 4-inch depth. Level with laser grader to achieve ½% slope. Thoroughly water to activate the stabilizing binder. It is better to over-water than under-water. Wait 24-48 hours, depending on the climate and the amount of water used. The field should be damp, but not muddy. As soon as the field allows, compact with one-ton roller. Do not use a vibratory plate or the compactor or vibratory setting on roller drums, as it may cause the binder to separate from the aggregate. Check for low areas, add additional infield or warning track mix as needed, and compact. Install base anchors and home plate. Hilltopper Ballyard Infield and Warning Track Mixes are the kings of ballyard mixes. With the help of today’s cutting-edge technology, we have been able to pair our custom aggregate blends with a water-shedding polymer coating developed by Stabilizer Solutions. This unique technology creates a ballyard that is waterless, dustless, and completely free of mud, which will save your grounds crew hours in maintenance and watering. Our Hilltopper Ballyard Mix has been used in such exciting venues as Harvard University, Dartmouth College, University of Iowa and more. Additionally, visitors can see our Hilltopper Ballyard Warning Track Mix at Yankee Stadium! The decomposed granite used in our Hilltopper Ballyard Mix has been crushed to the best size to provide stable footing, consistent ball hops and optimal sliding conditions. You’ll see with our one-of-a-kind Hilltopper Ballyard Mix that water beads on the surface of the field and then rolls away before your eyes. Our Hilltopper Ballyard Mix is ideal for newly constructed ballyards, where we recommend a depth of 3-4 inches for our infield mix. If you’re ready to implement a Kafka Granite Hilltopper Ballyard Mix at your ballpark our team is prepared to help you find the perfect solution. Save time and money with our Hilltopper Mound Clay Mix. Our Hilltopper Mound Clay Mix contains the same polymer coating as our infield and Warning Track Mix and can be used on the mound, in the batter’s box, or wherever a clay alternative is desired. With Kafka’s Hilltopper Mound Clay Mix, no water screening is necessary. Whether you decide to add some Topdressing to your existing field, refinish your field with a Stabilized Mix, or choose to implement a Hilltopper Ballyard Mix in your next stadium build, our specialists can work with your budget to find you the perfect ballyard solution. Our team of experts is sure to knock your next ballpark project out of the park! In People Places: Design Guidelines for Urban Open Space, Galen Cranz (1982) identified four major periods of development in the American Park System: the pleasure park, the reform park, the recreation facility, and the open space system. The four listed park systems accurately reflect the wants and needs of the American public through the years. 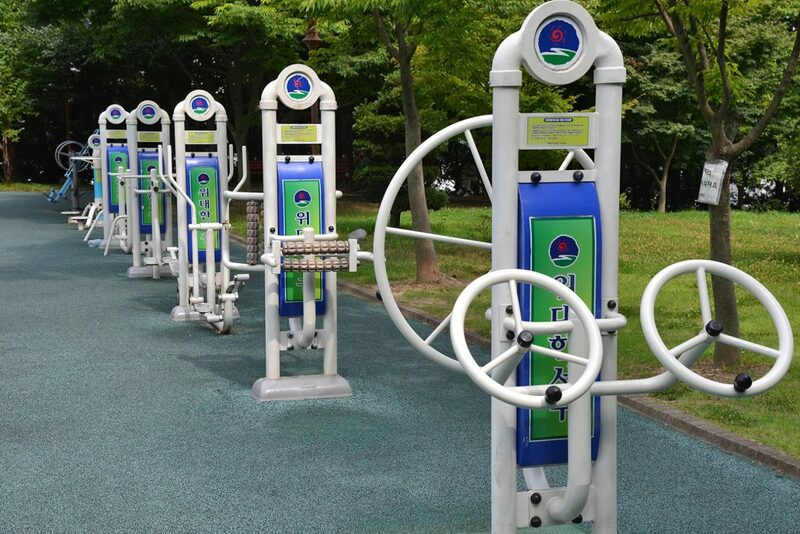 Now a new park system has evolved – the exercise park. In an effort to create more healthy landscaping across the country, more and more cities are turning to exercise parks for their public outdoor spaces. Kafka Granite is well-versed in the art of creating parks that excel in both form and feature. Our stone aggregates can be found in many outdoor spaces across the country. From paver grit to pathway materials, Kafka Granite can create custom stone blends that fit any criteria. In pleasure parks, aesthetics were of the utmost importance. SPUR defines pleasure parks as a “vast landscape of alternating trees and meadows, undulating hills, slowly meandering waterways, and broad reflecting ponds.” Pleasure parks were meant to be enjoyed at one’s pleasure, usually in the early morning or after a meal. Pleasure parks utilized broad areas of rolling hills and natural beauty while pointedly leaving out some of the most common features we see in today’s parks. For example, pleasure parks rarely included flower beds or sculptures, and they had few to no buildings in the park. Frederick Law Olmsted was one of the foremost pleasure park designers of the time (1850-1900). Olmsted was said to have believed that the greatest compliment to any city’s urban development was pure wilderness. This belief is responsible for the rolling nature of pleasure parks. Olmsted didn’t want any elements in his parks that would remind people of the city, or look to have been placed there by man. Of course, there were some structures in pleasure parks, such as pergolas and performance areas, but these constructions were made to be light and airy – allowing for shade while still offering an unobstructed view of the surrounding area. Circulation paths were also a common sight in pleasure parks. Several circulation paths and their subsequent pleasure parks can be seen in paintings by the famous artisans of the time. A beautiful example is Women In The Garden by Claude Monet which he painted in 1866. The scene depicts four women conversing while enjoying some sun on a circulation path in a pleasure park in Paris. Next up came the reform parks, these parks became popular during the progressive era of the 1900-1930s. It was during this period that urban development was booming. Factories were being constructed, and more families were moving into the city to find work. During this period of construction there seemed to be a few groups of individuals being left unconsidered, one such ground was the children. It was here in the 1900s that people first started campaigning for playgrounds to be constructed in the city. It was decided that children needed more daily exercise because at the time children only had the opportunity to play when their families went to the country on the weekends. Families wanted more than pleasure parks, they wanted areas for their children to run and play and the current neighborhood parks tended to be flat areas that were only one or two blocks wide. These desolate parks usually only contained straight walking paths and a few benches. The much needed change in the city park landscape was ushered in with the invention of the field house. These new field houses were built into the city parks and contained gyms, showers, meeting rooms, and communal rooms for events. The new field houses were flanked by playing fields and playgrounds, and the parks themselves underwent a large transformation. No longer was it desirable to have parks look untouched by man, now grass gave way to sand and asphalt, and natural tree groupings gave way to flowerbeds and shade structures. With the evolution of the reform parks came organized sports and activities. Reform parks quickly became an integral part of a neighborhood’s composition. You’ll see that parks turned into facilities between 1930-1965, this change was prompted by the realization that parks needed to serve everyone, not just small children. Whereas the reform parks were created to give children a place to play by building playgrounds, recreation facilities were built to serve the greater public. It was in this era that adult public sports became acceptable in culture; today you probably know someone who plays on an intramural sport team of some kind. Back in the 1930s organized adult sports such as football, baseball, and basketball became very popular among working class adults. Something else that became widely popular in the 1930s – bulk ordering. Recreation facilities were a huge success; with the addition of swimming pools these facilities saw thousands of visitors year round. As the suburbs developed people’s homes had less and less green space, facilitating the need for large community provided green areas to play. And so standards developed for park design and community programs. But with all progress comes errors, in the case of the recreation facilities their success was so great that communities wishing to create similar structures and programming rarely considered their individual needs or situations. Here is where bulk ordering came in. If you produced picnic tables, fencing, gym equipment, or bleachers from 1930-1965 you were in a very good place. To say that sales boomed who be an understatement. Anyone who lived through the great Tickle Me Elmo Christmas rush of 1996 will understand how once something becomes hugely desirable everyone will want one and will pay anything to get one. Such was the case with recreation facilities, and sadly like your Tickle Me Elmo that is probably sitting in a closet somewhere, recreation facilities became so common that they lost popularity. What was once viewed as revolutionary and fun was now seen as ordinary and lackluster. After the 1960s it seemed that every bit of available land was being snatched up for development. Giant parks had been created that had everything from basketball courts and swimming pools to running tracks and outdoor theaters. It was in this time that people started to ask themselves “is all this development too much development?” Unlike the days of the pleasure parks, cities no longer had ample green space to relax in. One could go to the community recreation center but with all of the activities offered it became hard to find a quiet moment. It was during this period in history that people started viewing undeveloped land as ready to use. Instead of wondering how many structures could be built community members were now ready to leave green space as it was – green. More unique and available forms of play sets were conceived using materials that were readily available, such as tires and railway ties. People were done with cookie cutter playsets – they wanted an opportunity to create a play structure that was unique and suited to their community’s needs. These structures were called adventure playgrounds. Tot lots also became popular; these were usually made of smaller items, such as one or two tires and sand pits. These tot lots traditionally took up a small portion of the greater park. Aside from the tot lots and adventure playgrounds the rest of the park was left open in what was called an urban plaza. What Frederick Law Olmsted thought would take acres could now be accomplished in a mere block with these new open spaces. The plazas were almost everything Olmsted wanted – large open spaces that appeared to have been untouched by man. Parks have always served as a means to get exercise. From young to old, parks were created to give all a way to exercise with friends and family. Other countries have been incorporating more direct means of exercise into their public parks for years, and in the early 2000s the U.S. joined in. Previous iterations of parks served the general purpose of getting people active; exercise parks are the first form of parks to be created with a specific purpose – to get people to exercise. Studies have shown that people prefer to exercise outdoors as opposed to indoors and with the rise in obesity the importance of having accessible exercise opportunities cannot be understated. Kafka Granite is passionate about making aggregate blends for these special parks. Outdoor fitness parks are traditionally created in one of four styles. A single piece of equipment, a composite fitness station is ideal for smaller parks. A long pathway network that moves through the park naturally. This is a great option for parks with long walking paths. A collection of equipment that is set up to be used in a collaborative manner. Typically arranged in a semi-circle, a joint use fitness zone is set up so that adults using it can keep an eye on their children. 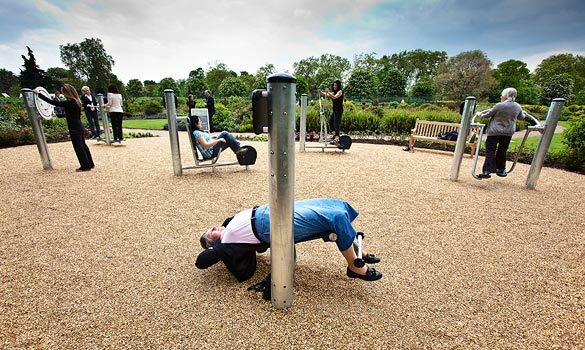 Exercise parks are quickly gaining popularity across the United States. 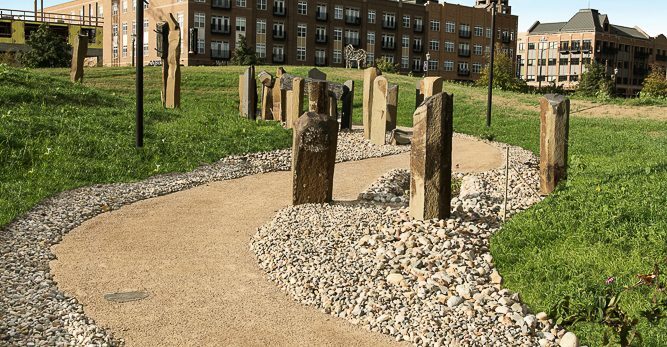 Kafka Granite is proud to offer various products from pathway materials to decomposed granite mixtures, that can be utilized in the creation of these new-age parks. Kafka has been contributing aggregate blends for the construction and restoration of parks for years. Our state-of-the-art crushing facility allows us to create custom tailored aggregate blends that can be used in pleasure parks, reform parks, recreation facilities, open space parks, and exercise parks. If you are ready to either revamp your communities current park or create a new destination, contact Kafka Granite today. At Kafka Granite, we take pride in having provided materials for a number of sizeable projects throughout the years. From Yankee Stadium to Navy Pier, we have been proud to have helped city planners, corporations, and universities alike revitalize their interior and exterior spaces through innovative projects and initiatives. One such opportunity to help reinvigorate an established space was the Charles B. Hayes Family Sculpture Park project at The University of Notre Dame.The University was looking to reclaim their once great sculpture garden and transform it into a green living space that could be enjoyed for generations to come and we were only too happy to assist. With the generosity of Charles B. Hayes, the University of Notre Dame was able to acquire the funds needed to restore this once great park to its former glory and beyond. The park originally opened in its phase one iteration in December of 2012 with five sculptures comprising the collection. A portion of the park was then closed after the last 2014 University of Notre Dame home football game to provide a space for materials to be stored during the Campus Crossroads Stadium Expansion. It was at this time that dirt excavated from the stadium project was stored in the then closed sculpture park. After the fill was removed, contractors were then sent in to excavated coal ash that had been generated by the University’s power plant. Additionally, the fly ash that had accumulated underground due to the presence of a landfill which previously occupied the same lot had to be excavated. With the site cleared it was time for the University of Notre Dame to being phase two construction in an effort to create the sculpture garden. WHERE: The finished Charles B. Hayes Family Sculpture Park spans an impressive eight-acre swath of land all the way from the DeBartolo Performing Arts Center to the corner of Angela Boulevard and Eddy Street. With the addition of the Charles B. Hayes Family Sculpture Park the University of Notre Dame has been able to complete their “greenbelt” vision; a green space highway that encompasses the Compton Family Ice Arena, Irish Green lawn, Notre Dame Avenue, and Cedar Grove Cemetery, creating a gracious and natural southern entrance to the campus. Kafka Stabilized American Heritage Pathway Mix, made with Organic-Lock, can be found dispersed through the entirety of the Charles B. Hayes Family Sculpture Park. These pathways connect each section of the park and give a cohesive and natural look to this vital feature of the park’s functionality. The Charles B. Hayes Family Sculpture Park can be found at the University of Notre Dame campus on the NE corner of Angela/Edison and Eddy St. in South Bend, IN. WHO: Michael Van Valkenburgh and Associates (MVVA) were tasked with creating this modern sculpture garden. They faced many challenges along the way, but with the help of the Snite Museum of Art, the finished Charles B. Hayes Family Sculpture Park is something to behold. MVVA knew that they needed a high-quality pathway material that could withstand all four Midwestern seasons while preserving the natural, sacred-inspired aesthetic. With success working with Kafka Granite on past projects such as the Kenyon College Middle Path and Brooklyn Bridge Park, MVVA felt confident that Kafka Granite Stabilized Pathways would be a solution for Notre Dame as well. Kafka was able to offer the park a high-performing pathway in the desired color. The product was a natural fit. The final product needed to complement the religious aspects of the park. The pathway would need to match the indigenous plants, shrubs, and trees utilized in the park. The overall theme of the park needed to reflect what the site would have looked like prior to the University of Notre Dame’s founding in 1842, meaning that the pathway system chosen had to be natural looking. Every material used would need to be able to stand up to the test of a four-season Midwestern year. The final pathway material selected would need to be permeable to help with water management. The products needed to be able to seamlessly flow around the concrete bases of the park’s installations and be easily amended should the layout change. Assist the University in creating a true arts district for all to enjoy. Serve as a literal gateway to the local community. Create a “greenbelt” for the southern campus entrance. And lastly, create a sacred place that could be enjoyed at any time of day, every day of the year. HOW: Kafka’s Stabilized American Heritage Pathway played a role in the final vision of Michael Van Valkenburgh and Associates. It was clear to MVVA that Kafka Granite was the best choice for this project. After verifying that Kafka had the material that the park needed there were still several challenges that the contractors had to overcome while getting their new pathway system into place. First, the layout of the park is somewhat undulating, meaning that the final pathway mixture needed to be pliable but have enough rigidity to maintain its form once placed. And second, the final pathway chosen needed to be able to survive in a harsh outdoor setting and withstand heavy foot traffic. The aggregate mixture that was ultimately chosen, the Kafka stabilized pathway mixture in the color American Heritage, utilizes patented Organic-lock technology that addressed both of these needs. It was this advancement that set Kafka Granite apart from its competitors. The binding agent used in the stabilized pathway mixture is the strongest organic aggregate binder on the market and is made from 100% naturally occurring materials. The finished material drastically reduces erosion compared to other natural crushed stone pathways and is wheelchair accessible. On top of its ability to resist erosion, the stabilized pathway mixture remains flexible and has self-healing properties so the surface will not crack or crumble over time like traditional hardscape materials. Organic-Lock™ is designed to create a stabilized surface that reduces maintenance while maintaining a natural look and feel. Once Michael Van Valkenburgh and Associates narrowed in on Kafka’s Stabilized American Heritage Pathway with Organic-Lock, they decided to install a mock up. Due to the site’s history as a landfill and later a storing facility during construction, there was no clean pad to hydrate the stabilized pathway mixture on prior to installation. To overcome this obstacle, crews laid down 4×8 sheets of plywoods to hydrate the decomposed granite mixture prior to installation. This may have been an unorthodox mixing and preparing method, but in the end, it ended up being the perfect solution to this challenging installation. With a finished pathway system that seamlessly blends through the entire sculpture garden, everyone that comes to visit the newly completed Charles B. Hayes Family Sculpture Park can enjoy the magnitude of the finished destination. The newly renovated Charles B. Hayes Family Sculpture Park has already had an enormous impact on the community surrounding the site. With breathtaking sculptures, lighted walking paths, a natural stone amphitheater, and captivating native flora, the finished Charles B. Hayes Family Sculpture Park will be enjoyed by all for years to come.